Complete program that will help you organize your wine cellar collections. ORGANIZER DELUXE brings together flexible data inventory features: Search, Replace, Sort, Table / Browser Viewers, Report / Label Wizards, HTML Generator Wizard, Backup, Scanner Support, Full Customization. 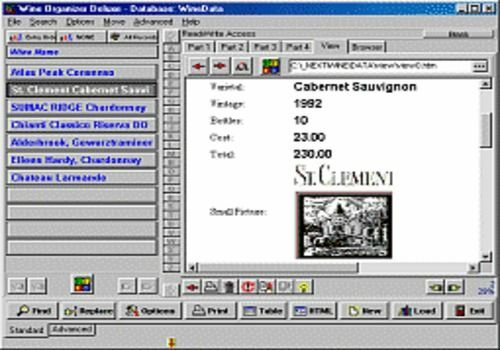 DESIGNER DELUXE (included) allows you to easily create your customized wine organizers. A partir de la commande "Régions", vous saisissez le nom des régions ou pays viticoles (Les éléments pré saisis sont modifiables).